Haven’t been diving lately and want a quick scuba refresher? Many people have learned to dive and have not continued, or have not been diving in some time. The refresher course is designed to refresh your scuba diving skills without the need to complete you Open Water certification again. In this short 2- 3 hour course you will go through the basic skills of scuba diving that you learnt in your open water course in a swimming pool. You will get familiar again with your scuba gear and practice skills like buoyancy control, regulator recovery and mask clearing. 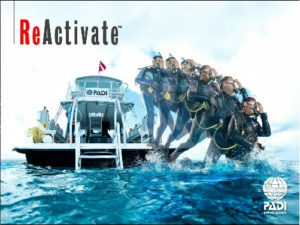 The ReActivate program is the perfect way to update your dive skills and knowledge from the PADI Open Water Course before jumping back in the water. The ReActivate course is the refresher + a small theory component. This theory will allow you to immerse yourselves in dive scenarios and make decisions. The theory component of your ReActivate course will be sent to you prior to your pool sessions and can be completed in your own time. You conveniently review scuba concepts on your tablet, mobile device or computer, then go diving with our PADI Instructor, John Gransbury. It’s quick and easy and a good way to prepare for your next PADI Course or get ready for a diving holiday. 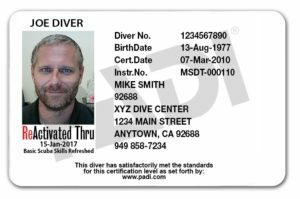 The best part is, divers who complete both the knowledge and in water skill refresher receive a replacement certification card with a ReActivate date on it. In general, we believe any diver that has not been diving in the last 12 months should consider a refresher course. If you have not been diving in a few years, you may need to consider completing your open water certification again, however we recommend that you contact our PADI Instructor, John Gransbury on 0457 007 040 to discuss your options. What Gear Will You Use (both options)? You’ll use basic scuba gear, including a mask, snorkel, fins, regulator, BCD, tank and weights. We will provide you with the wetsuit, BCD, regulator, dive computer, tank and weights for your refresher course in the course cost. You will need to provide your own mask, snorkel, fins and boots. Now! Courses can start with independent study of the PADI Deep Diver course manual. Bookings for the dives to complete the in water component are essential. The 4 course dives can be configured to fit even the busiest of schedules: you could spread your course over a number of day trips or weekends, and is usually combined with other charter trips.